(CNN) -- Sixteen-year-old Jessica Watson has spent the past seven months in a self-imposed solitary confinement of sorts. For 210 days, the avid sailor skippered her 34-foot yacht, the Pink Lady, around the world, a feat few others, let alone teenagers, have accomplished. But on Saturday afternoon, her solo trip ended in dramatic fashion as tens of thousands of cheering spectators and hundreds of boats turned out to welcome her home to Australia's Sydney Harbor, according to CNN affiliate Nine News. "I haven't seen a person for almost seven months and suddenly there's just people everywhere -- you know, faces, so much color, so much noise, so much everything," she told a news conference. "All I've seen for so long is empty waves, so it was amazing and very overwhelming. At the same time, I achieved what I set out to." That achievement -- her team claims she's the youngest person to sail solo, nonstop and unassisted around the world -- is not without controversy. A storm over whether she'd bested Jesse Martin, a fellow Australian recognized in 1999 as the youngest to make the voyage at 18, came to a head on sailing news websites last week, centering not on her age -- nor on whether she went around the world -- but on whether she had sailed far enough. 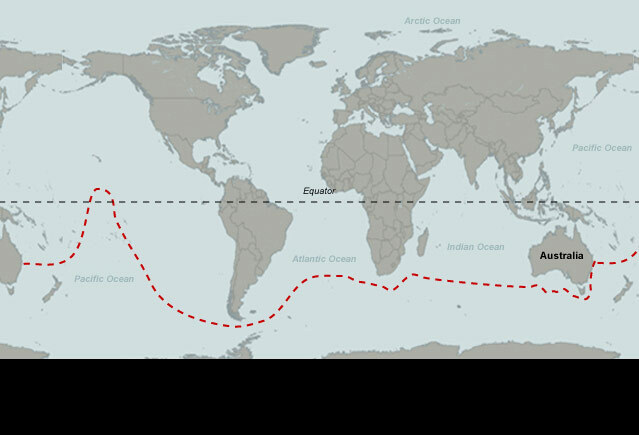 Sailing websites such as Sail-World.com reported last week that Watson's route wasn't long enough orthodromically -- that is, by measuring the shortest distance from point to point on a route -- to hit 21,600 nautical miles, the length of the equator. Watson's team has said she had sailed about 23,000 nautical miles, though it hasn't claimed the distance is orthodromic. Critics have said her logged distance includes zig-zags that yachts inevitably make, and those zig-zags do not count for orthodromic distance. The World Sailing Speed Record Council, which certified in 1999 that Martin was the youngest to make the trip, mandates 21,600 orthodromic nautical miles for round-the-world courses. Watson's team has responded that it wasn't aiming for any WSSRC record, because the council has stopped recognizing the "youngest" category. Those who turned out to witness her arrival Saturday at Sydney's Opera House weren't fazed by the dispute. Prime Minister Kevin Rudd called her "our newest Australian hero" minutes after she stepped off her pink-hulled sailboat and onto the pink carpet that well-wishers had rolled out for her, her legs still wobbly after so long at sea. And before she could pull up to the wharf, her vessel was practically swamped by hundreds of other boats in the harbor -- all admirers wanting to participate in the momentous day. Watson also shrugged off the controversy. "It's not something that worries me because there always have been and there always will be some people who choose to not acknowledge the record, and for me it wasn't ever actually about the record, so I'm not worried at all," she said. Official record or not, her accomplishment is noteworthy. During the course of her journey, she battled 40-foot waves and six knockdowns, including one that knocked her yacht over to the point where her mast hit water. Her round-trip odyssey started in Sydney on October 18. She spent the better part of the year traveling northeast through the South Pacific and across the equator, south to Cape Horn at the tip of South America, across the Atlantic Ocean to South Africa, through the Indian Ocean and around Southern Australia. But Watson was modest as she addressed spectators Saturday, taking issue with Rudd's use of the word hero in describing her. "I'm an ordinary girl who believed in her dream," she said. CNN's Jason Hanna contributed to this report. Ellison's goal to market the America's Cup to the U.S.